Frankly, I do not like pears. I like Asian pears, the big ole pears that look like apples and abound during the fall and winter in places like South Korea, but Bartlett pears...not so much.They're just too grainy. Not to mention, when we dive pears, they just look a little rough and I have a hard time biting into them. But I have no problem skinning and slicing them and making a nice pear cobbler on a cool fall evening! Prepare cobbler topping by stirring together 1 cup Flour, 2 Tbsp. Sugar, 1 1/2 tsp. Baking Powder, 1/4 tsp. Salt and 1/2 tsp. Cinnamon. Cut in 1/4 cup butter with a pastry cutter, fork or two knives. 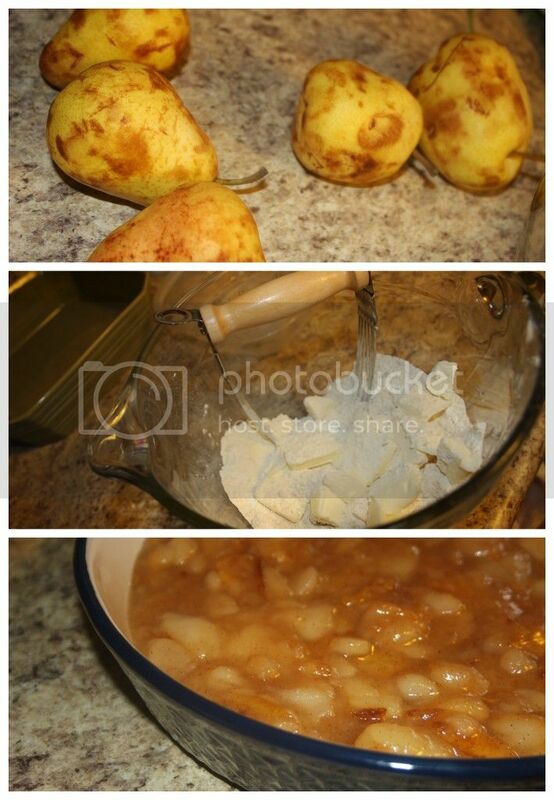 In a large sauce pan stir 6 cups sliced and peeled Pears, 1/3-1/2 cup Sugar (to taste) and 1 Tbsp. Lemon Juice, bring to a boil. Stir occasionally once fruit begins to release it juices. Reduce heat and simmer, covered, about five minutes until fruit is tender. Combine 2 Tbsp. Cornstarch with 1 Tbsp. Water, stir into filling and cook until thickened. In a small bowl, stir together 1 egg and 1/4 cup milk. Add to flour mixture and stir until just moistened. Fill 2-quart baking dish with filling before spooning dough on top of filling. Bake 20-25 minutes or until top is golden brown. Let cool for about an hour. Serve with ice cream or at least enjoy with good friends you haven't seen in a long time!